New papers on microbiology of the built environment, December 19, 2015 – microBEnet: the microbiology of the Built Environment network. New papers on microbes inside homes and musea, drinking water systems, during spa treatment, and in an urban estuary. We investigated the source-sink relationships of airborne bacteria in 29 homes in the San Francisco Bay Area. 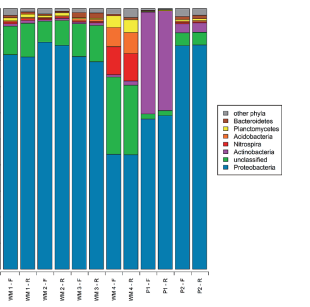 Samples taken in the sites expected to be source habitats for indoor air microbes were analyzed by 16S rRNA-based pyrosequencing and quantitative PCR. The community composition was related to the characteristics of the household collected at the time of sampling, including the number of residents and pets, activity levels, frequency of cooking and vacuum cleaning, extent of natural ventilation, and abundance and type of vegetation surrounding the building. 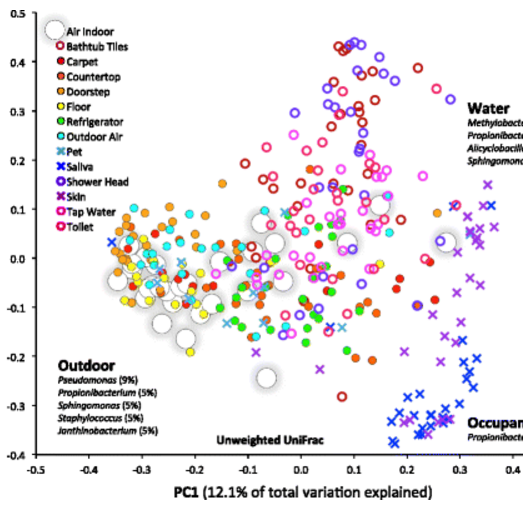 (…) The number of residents, presence of pets, and local tap water also influenced the diversity and size of indoor air microbes. 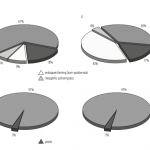 The bacterial load in air increased with the number of residents, activity, and frequency of natural ventilation, and the proportion of bacteria putatively derived from skin increased with the number of residents. To date, the scientific source materials usually focus on microbial contamination of the museum or library collections themselves, while the exposure of persons who professionally deal with this type of objects in cultural heritage conservation laboratories is ignored. The study was carried out in 9 naturally ventilated conservation laboratories with no history of water damage. Viable (understood as culturable) bioaerosol stationary samples were collected in both outdoor and indoor environments using 6-stage Andersen impactor. (…) At workplaces, the concentrations of viable microorganisms in air were below 2000 cfu/m3 and accounted for not more than 5.5% of total microbiota. (…) The precise assessment of microbial hazards in conservation laboratories should comprise control of both viable and total particle counts. The hermetization of such workplaces and control of relative humidity should be implemented and maintained to assure proper hygienic conditions. Whilst the sampling and methodological biases associated with PCR and sequencing have been studied in other environments, they have not been quantified for drinking water. (…) To evaluate this, we undertook a study with replication at multiple levels including sampling sites, sample collection, PCR amplification, and high throughput sequencing of 16S rRNA amplicons. The variability inherent to the PCR amplification and sequencing steps is significant enough to mask differences between bacterial communities from replicate samples. (…) Despite this, we captured significant changes in bacterial community over diurnal time-scales and find that the extent and pattern of diurnal changes is specific to each sampling location. Further, we find diurnal changes in bacterial community arise due to differences in the presence/absence of the low abundance bacteria and changes in the relative abundance of dominant bacteria. Finally, we show that bacterial community composition is significantly different across sampling sites for time-periods during which there are typically rapid changes in water use. 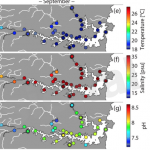 This suggests hydraulic changes (driven by changes in water demand) contribute to shaping the bacterial community in bulk drinking water over diurnal time-scales. 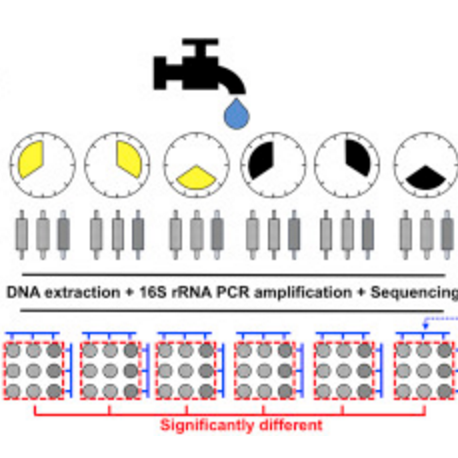 Next-generation sequencing of the V1—V2 and V3 variable regions of the 16S rRNA gene generated a total of 674,116 reads that described six distinct bacterial biofilm communities from both water meters and pipes. (…) The communities observed in water meters from households that did not complain about their drinking water were defined by sequences representing Proteobacteria (82—87%), with 22—40% of all sequences being classified as Sphingomonadaceae. 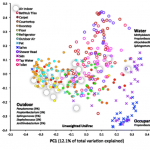 However, a water meter biofilm community from a household with consumer reports of red water and flowing water containing elevated levels of iron and manganese had fewer sequences representing Proteobacteria (44%); only 0.6% of all sequences were classified as Sphingomonadaceae; and, in contrast to the other water meter communities, markedly more sequences represented Nitrospira and Pedomicrobium. The biofilm communities in pipes were distinct from those in water meters, and contained sequences that were identified as Mycobacterium, Nocardia, Desulfovibrio, and Sulfuricurvum. Review: Antibiotic resistance in urban aquatic environments: can it be controlled? Over the last decade, numerous evidences have contributed to establish a link between the natural and human-impacted environments and the growing public health threat that is the antimicrobial resistance. In the environment, in particular in areas subjected to strong anthropogenic pressures, water plays a major role on the transformation and transport of contaminants including antibiotic residues, antibiotic-resistant bacteria, and antibiotic resistance genes. 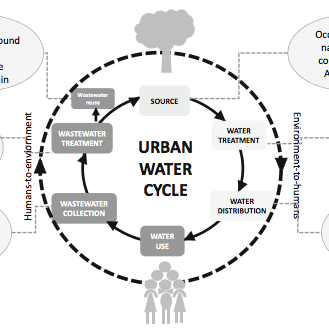 Therefore, the urban water cycle, comprising water abstraction, disinfection, and distribution for human consumption, and the collection, treatment, and delivery of wastewater to the environment, is a particularly interesting loop to track the fate of antibiotic resistance in the environment and to assess the risks of its transmission back to humans. 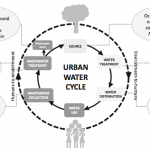 In this article, the relevance of different transepts of the urban water cycle on the potential enrichment and spread of antibiotic resistance is reviewed. According to this analysis, some gaps of knowledge, research needs, and control measures are suggested. The critical rationale behind the measures suggested and the desirable involvement of some key action players is also discussed. Microbial communities of patients with psoriasis vulgaris were characterized prior and post a 3-week selenium-rich water balneotherapy treatment at the thermal care center La Roche-Posay (La Roche-Posay, France). Balneotherapy consisted of high-pressure filiform showers, baths, facial, and body spray treatments as well as La Roche-Posay thermal spring water (LRP-TSW) consumption. Swabs were taken from affected and proximal unaffected skin and the 16S rRNA bacterial gene was used to analyze the composition of bacterial communities. Using the same 16S rRNA gene tool, we tried to describe the LRP-TSW bacterial landscape. (…) In psoriatic patients, a poor bacterial biodiversity was noticed and the bacterial communities were similar on unaffected and affected adjacent skin. Family analysis identified, for the first time, Xanthomonadaceae belonging to Proteobacteria phylum and known to be keratolytic, associated with the clinical improvement observed after a 3-week balneotherapy treatment. This data supports the interest of selenium-rich thermal spring water in the treatment of psoriasis vulgaris. Estuaries are among the most urbanized coastal ecosystems and as a consequence experience substantial environmental pressures, providing ideal systems to study the influence of anthropogenic inputs on microbial ecology. 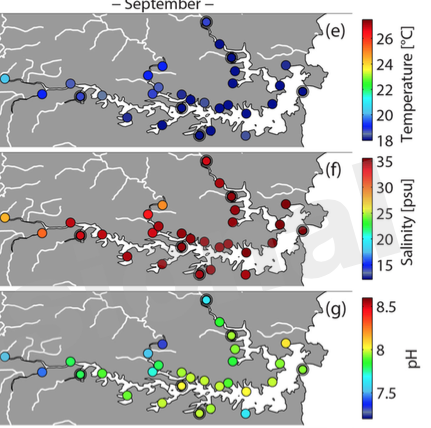 Here we use the highly urbanized Sydney Harbour, Australia, as a model system to investigate shifts in microbial community composition and function along natural and anthopogenic physicochemical gradients, driven by stormwater inflows, tidal flushing and the input of contaminants and both naturally and anthropogenically derived nutrients. 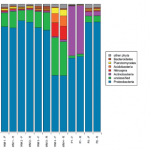 Using a combination of amplicon sequencing of the 16S rRNA gene and shotgun metagenomics, we observed strong patterns in microbial biogeography across the estuary during two periods: one of high and another of low rainfall.